Now I haven't mentioned my adventures in Wellington yet. My Partner in crime (fellow trumpeter Colette) and I have been crafting together the whole trip. She was doing embroidery while I was knitting. We had been looking out for a chance to visit some crafts stores but nothing ever seemed to pan out. In Auckland we ran out of time to get to the other side of the city and back. Rotorua we had no time at all and Ohakune had no craft stores to find. So come Wellington we really really wanted to find something. In a souvenir shop in Wellington I managed to find a stand with New Zealand cross stitch bookmarks. The only one I liked and that had anything to do with the trip we'd been on (I didn't visit Queenstown at all!) was a tiki bookmark. As soon as I got back to the hotel I had to start working on it immediately. So although I haven't been stitching much I do have some progress to show. This was on the Sunday afternoon and we didn't get time to explore anymore until Tuesday where we had the whole day to ourselves so we went exploring. We searched out one shop we had been told of that was apparently great but we weren't impressed because it was all dress making fabrics. Great fabrics and awesome looking store but not what I'm after. But while we were there they gave us a map which was a craft map of Wellington and through that we found a store called Made on Marion. It was like walking into heaven. They had a bit of everything from quilting fabrics to cross stitch threads and patterns. So both of us were happy. To make it even better they had 50% off cross stitch patterns. So I may have bought a couple of kits and a big blackwork pattern. I love this pattern of Captain Cook's endeavour and it's important for us to because Cook in the Endeavour was the one to find Australia's East coast. I love these three little kits that I got especially the sheep they come with tassles and purple felt for the back. The orange and red kiwis are an Assisi pattern I think the colours look stunning. The other kiwi will be Lana's to do when she wants to. I love the patterns I managed to find and they will always remind me of my trip to New Zealand. Hopefully it won't be long before I finish my first bookmark. What a great trip!! Love the bookmarks - especially the sheep. It looks darling. Yay for finding some stitchy souvenirs! Those are great stitchy souvenirs. They will be a lovely way to remember your trip. 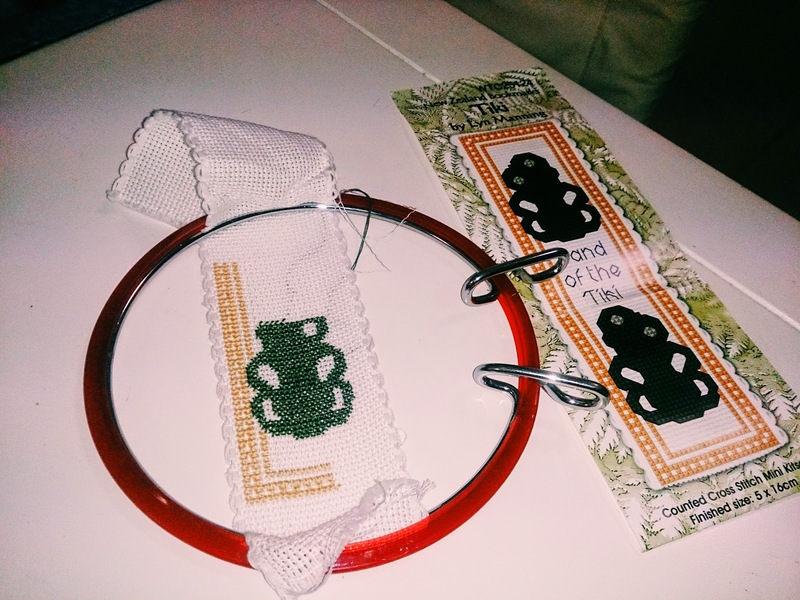 Lovely bookmark designs and the blackwork pattern I would have bought also.